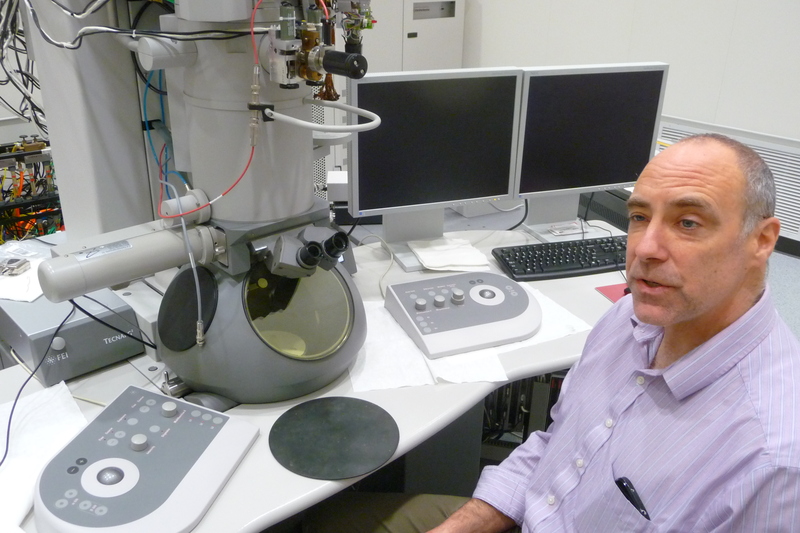 Ames Lab’s Matt Kramer with the Tecnai transmission electron microscope at the new Sensitive Instrument Facility (SIF). The microscope was moved to the SIF from Wilhelm Hall on the Iowa State University campus. In 2015 Ames Laboratory scientists who investigate materials’ fundamental properties received their Christmas presents early. In November and December technicians unpacked and installed around $6 million worth of high-tech microscopes, some capable of identifying individual atoms and how they’re arranged in materials. The three new devices joined one already owned by the lab, a Department of Energy (DOE) facility Iowa State University manages on its campus. The equipment is installed at the lab’s Sensitive Instrument Facility (SIF), a fortress against interference recently finished northwest of the ISU campus. In my last post, I described the many steps the building’s designers took to keep vibrations and electromagnetic noise from disturbing the powerful microscopes inside. A SIF schematic with notations designating the location of each instrument. From Ames Laboratory’s Inquiry magazine. It’s not a much to look at from the outside. The long, low building just northwest of the Iowa State University campus could be classrooms or offices, maybe for a small manufacturer or a medical practice. The offices and public spaces are airy and furnished in a style echoing IKEA. There’s no hint that the structure is unique in Iowa and rare in the United States. But take a tour, as I did last week, and you learn that this, the first new scientific structure Ames Laboratory has built since 1961, is a near-fortress against even the tiniest outside interference.